Masoud Barzani, uncontested leader of more than 25 million Kurds living in parts of Turkey, Iran, Syria and Iraq, has given a sharp kick in the teeth to Bashar al-Assad and the Syrian Kurds’ Democratic Union Party (PYD). The PYD, which is affiliated with the outlawed Kurdistan Workers' Party (PKK), this week declared a transitional administration in northeastern parts of Syria bordering Turkey. Barzani, president of the Iraqi Kurdistan region, accused the PYD in Syria of “autocracy,” rejecting its unilateral declaration of independence in Syria’s Kurdish northeast. He said the PYD was missing “a golden opportunity” by trying to hurriedly seize unilateral control of the Syrian Kurdish areas, or Rojava. “The PYD claims to have made a revolution in Rojava. But may I ask whom is this revolution targeted at? The only thing [the PYD] does is administer areas handed over to it by the [Assad] regime,” Barzani said in his written statement. Barzani warned that the PYD was driving Syrian Kurds down a dead-end. Barzani, who brokered a July 2012 deal in Erbil to forge a united stance among all Kurdish parties, called on the PYD and all other Kurdish groups to return to the terms of that accord. “Despite our reservations about the PYD’s behavior and actions, we are happy to return to consensus, because autocracy will neither benefit the PYD nor the Kurdish people,” Barzani said. “The PYD benefited from the agreement, but it did not commit to it. It suppressed other political parties at gunpoint and secretly sided with Assad’s regime to make itself a solo de facto military force on the ground,” Barzani said without mincing his words. The Kurdish president also accused the PYD of fighting a war that does not serve Kurdish interests, saying the PYD’s clashes with Qaeda-affiliated jihadists since last summer have forced tens of thousands of Kurds to flee Rojava. The PYD’s armed wing, the People’s Protection Units (YPG), also clashed in late March with other Kurdish forces in northeast Syria and in the city of Amuda, where local residents protested against the arrest of three Kurdish activists by the PYD. “It was decided Kurds would not get involved in the internal Syrian war, but the PYD got our people in a war that is not in their interest,” Barzani said. Barzani’s Iraqi Kurdistan regional administration denied PYD leader Saleh Muslim entrance to its territory last week, which was interpreted as a sign of the disagreements between the PYD and the KRG. The Syrian Kurdish leader says he had to wait five days before ultimately being told he would not be allowed into Iraqi Kurdistan. Barzani also denounced the PYD for banning the Kurdistan flag in Rojava. The Iraqi Kurdish leader is set for an important visit to Diyarbakir tomorrow, Saturday, where he will meet with Turkish Prime Minister Recep Tayyip Erdogan. Selin Caglayan, writing today for Rudaw, Kurdistan’s English-language newspaper, notes the meeting comes when Erbil’s differences with the PYD are escalating and Ankara’s peacemaking with the PKK is on the rocks. The weekend summit will focus on bilateral ties, Ankara’s recently improving relations with Baghdad, developments in Syria and the government’s peace process with the PKK, the premier’s aide and foreign ministry sources in Ankara told Rudaw. Barzani’s visit “is a message both for the PYD and PKK,” said Mehmet Ozcan, an academic and director of the Ankara Strategy Institute. “’You are not the only Kurds in the region’ is the message,” he told Rudaw. ”In Syria the PYD is bullying the other Kurdish parties and trying to be the sole representative of the Syrian Kurds, as the PKK once did in Turkey,” Ozcan said. “On the other hand, the PKK is creating problems by blocking the peace process and putting pressure on the public before the local elections” in March, he added. Kurdish author and commentator Irfan Aktan agreed that developments in Syria, where the PYD runs its government from the city of Qamishli with strong support from the PKK in Diyarbakir, were driving Ankara and Erbil ever closer. “This alliance would weaken the Diyarbakir-Qamishli axis, and this makes many Kurds uneasy,” he said. It expects Barzani to propose mediating between Ankara and PKK headquarters in the Kurdistan Region’s Qandil Mountain to restart a stalled peace process. While Ankara’s ties with Baghdad are on the mend, its relations with Erbil have been hitting new highs. Turkey is Erbil’s largest trade partner, and the two are involved in multi-billion dollar pipeline deals to get the Kurdistan Region’s rich energy reserves to markets in Turkey and beyond. 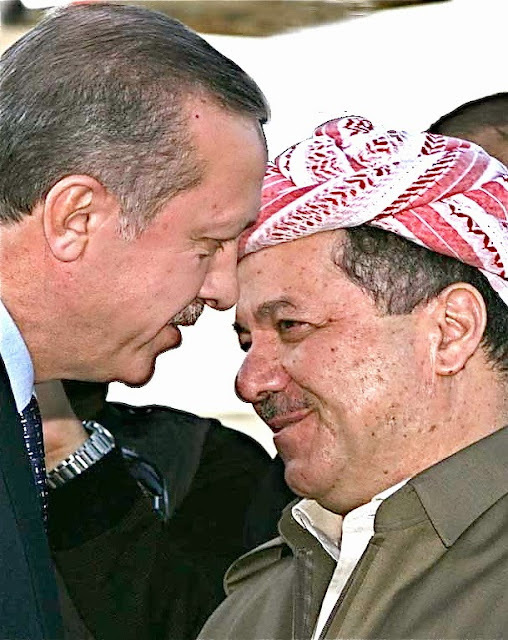 Barzani reportedly visited Diyarbakir in 1996 and stayed one night. But this will be his first visit as president. He arrives in Turkey with beloved Kurdish singer Shirwan Perwer, who has been in exile for 37 years. Erdogan announced that Perwer would sing a duet in Diyarbakir with legendary Kurdish singer Ibrahim Tatlises.